We like to serve a little welcome beverage when everyone arrives for class, at our Market Class we made a beautiful Citrus Thyme Water. This is great to do with any combination of fruit and herbs. Make a huge batch and just have it on hand. The flavors intensify as they sit. We served it in an oversized glass jar, an old ladle & a collection of vintage cocktail napkins. It's so easy to do ! Scroll down for the full recipe below. Thinly slice 3 oranges, 3 lemons and 3 limes. 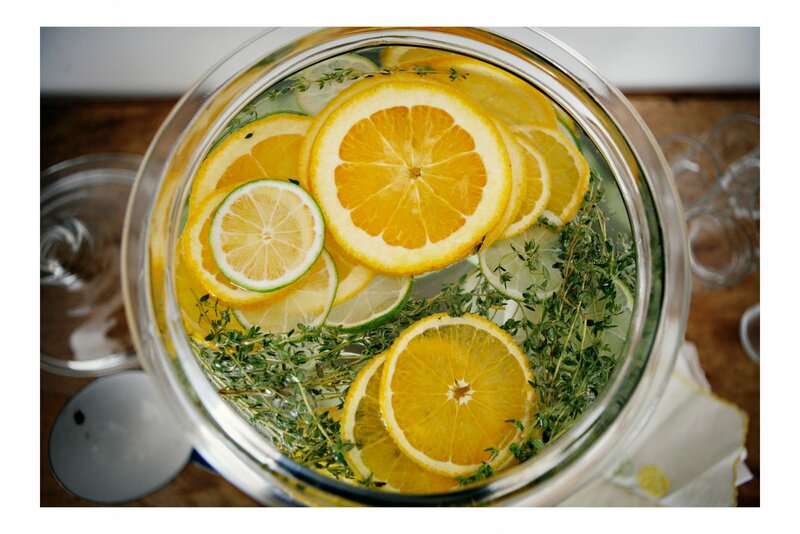 To 2 gallons of water, add the citrus slices and a handful of thyme sprigs. Let stand refrigerated for at least 2 hours before drinking.